The Bags | It’s no secret that I love my bags (see my most recent purchase here) so it’s always the first section I head for when browsing. I have a huge thing for the Chloe Drew bag (see this post for proof) and the Saint Laurent tote is actually next on my purchase list! 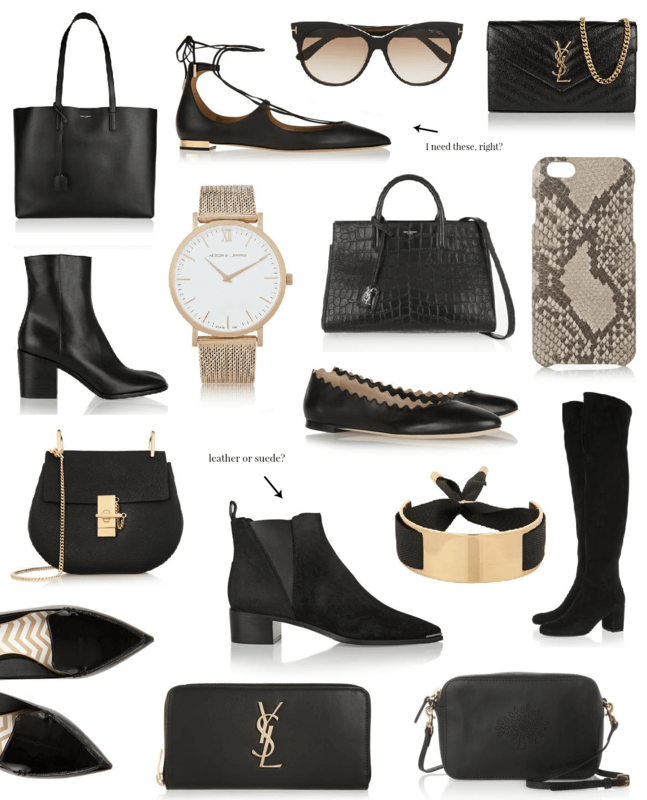 The Shoes | I remember when everyone went crazy for lace up flats, but it was the original Aquazzura ones that caught my eye – they’re just so perfect! I also adore over the knee boots (especially with floaty dresses) and those Kirkwood flats, my only question is black, white or silver? I also have a major crush on the Acne Jensen boots and have done since they came out last year (I believe) but can’t decide between leather or suede, as seen above – what do you think? The Accessories | That watch. I am head over heels for that Larsson Jennings watch. I mean, look at it! The silver version is pretty dreamy too. I’m always keeping my eyes out for a new purse incase my Kors one decided to pack in and that Saint Laurent one is rather special *heart eyes emoji*. What would you buy if money was no object? Any high end items on your wishlist? Please check out my brand new blog sale! Everything has to go by this weekend.